When the weather gets colder, it's the perfect time to learn how to make apple cider with spiced rum. It's not necessary to possess the skills of a chef; all you have to know is how to turn on the stove. Serve this festive drink at your holiday party or sip it at home by the fire. In a large pot or saucepan, pour the cider, add the cinnamon sticks and spices, and turn up the heat on the stove. Allow the mixture to come to a boil for about five minutes, and then reduce the heat and let it sit for 15 minutes. Add the rum to taste, and then strain the mixture into another pot. A cheesecloth works well for removing any particles and larger items, like the cinnamon sticks. You may choose to wrap the spices in cheesecloth before adding them to the cider to save yourself this step. You can also make spiced cider by using a crockpot. Allow the mixture to cook on low for three or four hours and use a ladle to serve the cider when you are ready. In this case, you definitely should tie the spices in cheesecloth so you don't have to strain the liquid. Be sure to serve the cider in heatproof glasses. Using ceramic coffee mugs or glass mugs will show off the pretty color of the mixture. Garnish each glass with a cinnamon stick. Some people feel that Captain Morgan's spiced rum is a good choice for this drink because it's sweet and has a flavor that blends well with the other ingredients. Others prefer to use flavorful dark rum, which is also sweet but a little smoky. Gosling's is a popular brand of dark rum and can also be used to make Dark & Stormy cocktails. Whichever rum you choose, don't feel compelled to use an expensive rum. Any basic rum will do. Omit the rum for a virgin or kid-friendly version. Wait and add the rum when serving the drink so guests can choose how strong they prefer to make their drink. Make a buttered, spiced rum by adding a little butter to each mug before you pour the cider and rum. Use real butter rather than a substitute for the best results. Stir in brown sugar if you prefer your spiced cider on the sweeter side. Although the typical garnish is a cinnamon stick, you can add another dimension of flavor by sprinkling crushed butterscotch candy in your drink. Float thin slices of apple in your drink. Add cranberry juice to create some festive color in your cocktail. Add lemon rind when you prepare the cider to lend it some tartness. 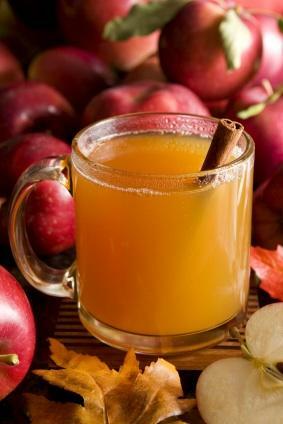 Apple cider with spiced rum makes a great party drink because you can prepare it in advance. Consider making it as a Thanksgiving drink or as a Christmas treat. Serve it after dinner as an alternative to dessert, and your guests will leave warm and happy.